Crush the biscuits in a food processor until you have fine crumbs, then add the melted butter. Process again to combine. The crumbs should stick together when squeezed. Press into the springform cake tin halfway up the sides. Refrigerate while you make the filling. Place the cubed butter and the golden syrup into a saucepan and heat, stirring until melted. Add the tin of condensed milk and stir on medium heat for approximately 5-8 minutes until the mixture bubbles, thickens and starts to change colour. Remove from the heat and cool for a couple of minutes before pouring into the chilled crumb crust. Refrigerate until cold and firm. The pie can be made up to this point and finished when you are ready. Slice 3-4 bananas and mix them with the whipped cream. Pour into the tart shell on top of the chilled caramel and smooth down to a nice flat surface. 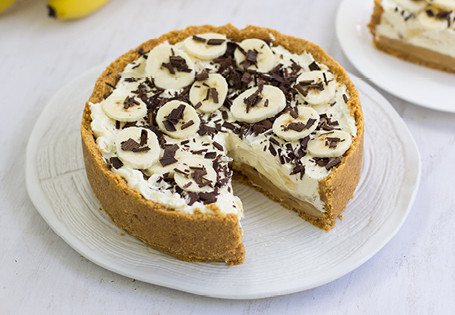 Sprinkle chocolate shavings onto the top of the tart and then decorate with the final sliced banana. TIPS: If making ahead of time, toss the bananas in a small amount of lemon juice (to pause browning of the bananas). This pie is very rich and you only need a small slice! *Note: You’ll need a 23cm diameter springform cake tin.